João Melo will participate in a multilingual roundtable discussion around the topic “Cultural Dissemination Through Translation” Friday, May 31 from 10-11 am EMU Metolius room. 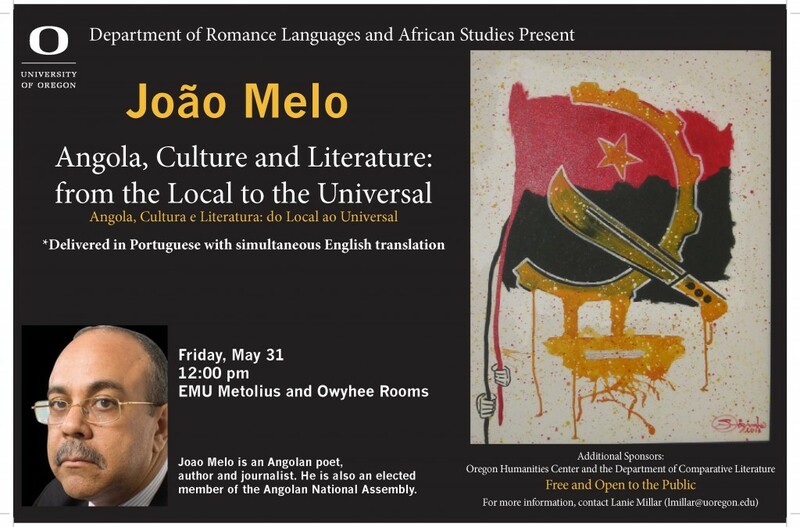 At 12pm, João Melo will give a public lecture entitled “Angolan Culture and Literature: From the Local to the Universal” also in the EMU Metolius room. This talk will be in Portuguese with simultaneous translation to English. A reception will follow. All students and faculty are welcome. João Melo has published twelve works of poetry, most recently Cântico da terra e dos homens (2010), five works of fiction, including O homen que não tira o palito da boca (2009) and the book of essays Jornalismo e política (1991) as well as contributions to the Angolan journals ABC, Jornal de Angola and Lavra e Oficina, the Gazette of the Angolan Writers Union. He received an honorable mention for the Sonangol Prize in Literature in 1996. He has worked as a journalist for the National Radio of Angola, has directed several media outlets such as the Angola Press Agency-ANGOP, the Jornal de Angola and O Correio da Semana, and currently heads the communications firm Movimento. He is a founding member of the Angolan Writers Union and is a representative in the Angolan National Assembly.